If last December 2 “GAS Tour” was coming to an end, the work of the trio was just beginning, as the preparations of his next album would not wait; just three months after stopping the end of the tour the band announces the publication of a new album, recorded in 26 out of almost 120 dates of their the extensive tour, of more than two years, after the release of their successful album “GAS“, a piece of rock that has been highlighted either in publications from blues to heavy metal. The album will be followed by a very different, more relaxed, tour from what is usual in Los Brazos: although they warn that there are still some relevant dates to be announced, at the moment there are just about 20 dates in the calendar, which already features dates until November 24. 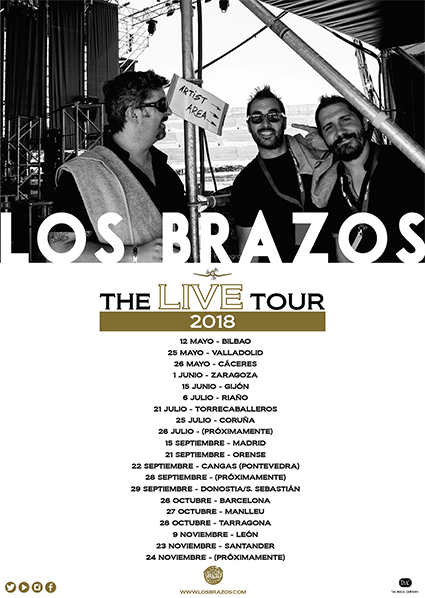 With this new publication, signed with “The Music Company” record label, Los Brazos want to thank and summarize their presence in all the places they have visited during these years, from small venues to big festivals, where they have left a path of good feelings, reflected in networks and media throughout the peninsula and islands. Also, the album will be a review of their past releases, and the boys add that this months are intended to be the time to work in an upcoming studio album, which is expected to be released in 2019. “We are very happy and very grateful (and maybe by May we will be also feeling rested). It was tough for us to stop the tour, because this is real dope, but we had to work on new things and rest a little from the road. Now we only wish, sickly, to see you very soon, to show you our new stuff, and also to enjoy this album, which contains all our affection for the people, scenarios, cities and towns in which we have had the fortune to be”. The tour will officially start in the ‘Kafé Antzokia‘ of their hometown, Bilbao, on May 12, and tickets for the whole tour are now available online.